The South African Army dates its existence to 1912. The white population of the newly-formed Union of South Africa existed in heavily-armed rival English- and Afrikaans-speaking factions, and the new army tried to channel these aggressive tendencies. The army’s first uses were as strikebreakers in 1913 and 1914. When the First World War broke out, the Union sent an expeditionary force of 67,000 men into neighboring German South-West Africa and overwhelmed the tiny German garrison there. The army also showed its loyalty to the British Empire by quickly crushing an attempted Boer revolt, using many Afrikaans-speaking troops in the effort. A South African brigade served in German East Africa from 1916 until 1918, suffering a shocking 2,000 dead and 12,000 hospitalized, mostly from disease. Another brigade fought Senussi tribesmen in Egypt and then made up part of 9th Scottish Division on the Western Front. This brigade also suffered horrifying casualties, losing over 3,000 men in the Somme offensive in July 1916 alone. Britain officially removed its garrison from South Africa in 1921, turning over responsibility to the Union Defence Forces. The army remained small and under-funded, and during the 1930s served mostly as a job-training program for unemployed young men. Several times it deployed against striking industrial and railway workers, particularly those labor actions undertaken to demand changes to South Africa’s ever-tighteniong racist laws. In 1939, Britain’s declaration of war against Germany caused a serious political upheaval in South Africa. For three days debate raged, until the World War One hero J.C. Smuts split the ruling United Party to oust prime minister J.B.M. Hertzog, an Afrikaner nationalist who wanted to keep South Africa neutral. Smuts rammed through the declaration on 6 September, but anger over his action smoldered for years afterwards. The army quickly began to expand, but under some limitations. At first South Africa began conscripting all young white men aged 17 to 21, but this led to political unrest among some of the Boer communities. In February, 1940, the army reorganized itself, separating the conscripts into the Permanent Force (the small pre-war professional army), with a responsibility to serve only with the Union. Volunteers who took the “Africa Oath” could serve anywhere on the continent — but not elsewhere. These men made up the Active Citizen Force, and these units would form the South African divisions in Egypt. South Africa had only 2.4 million white citizens, but the Union’s racial politics would not allow the arming of its South Asian, “Colored” (mixed race) or black communities. These instead furnished drivers, construction workers and other non-combat personnel, though these men were issued arms in combat zones. Keeping with tradition, and hoping to build Boer enthusiasm for the war (and, not coincidentally, get potential malcontents safely into uniform), the South African Army first organized a Mounted Commando Division from existing volunteer mounted rifle units. These troops would later become part of the Tank Corps, which despite the name operated armored cars. The cavalry division never left the Union before it was dissolved to provide personnel for an armored division. Three infantry divisions would form the bulk of the South African ground forces. The 1st Division went to British East Africa for the invasion of Italian East Africa with the understanding that South African troops would not be deployed north of the Equator. It and the 2nd Division also served in Egypt. The 3rd Division never fully completed its formation, and except for one brigade remained in the Union for the war’s duration. First South African Division performed well in East Africa, spearheading the advance from Kenya into Somaliland and on into the heartland of Ethiopia. During the summer of 1941, it re-deployed to Mersa Matruh in Egypt’s Western Desert, while 2nd South African Division arrived and was stationed at El Alamein. In addition, several South African armored car regiments deployed in the desert, most equipped with South African-made Marmot-Herrington armored cars. War in the desert did not go well for the South Africans. Their units arrived short of motor transport, and took some time to achieve full mobility. First South African Division entered large-scale combat during Operation Crusader in November 1941. On the ridge line at Sidi Rezegh southeast of Tobruk the 5th South African Brigade was overrun and destroyed while 1st Brigade also suffered heavy casualties. Second South African Division fought along the Libyan border as part of the subsidiary effort to capture the isolated German and Italian garrisons there. During the Gazala battles, 1st South African Division stood along the perimeter line with 1st, 2nd and 3rd Brigades (3rd having been re-assigned from 2nd Division, to replace the lost 5th). Second South African Division, with 4th and 6th Brigades plus the 5th Indian Division’s 9th Brigade, manned the Tobruk defenses. The division and over 10,000 prisoners were lost when Tobruk fell following the Gazala battles. First Division, led cautiously by Maj. Gen. Dan Pienaar, escaped to Egypt with relatively few losses. The South African high command, in common with the other Dominions, had been increasingly unhappy with British direction of the war. Non-British politicians and generals felt their troops faced more risks than did similar British units. The South Africans felt that 5th Brigade was needlessly exposed at Sidi Rezegh because it was operating with the British 7th Armoured Division instead of under South African command. Pienaar complied with his government’s wishes by preserving his nation’s last armed force, but he infuriated the British who whispered that he had lost his nerve and fallen into an alcoholic stupor. The loss of an entire division at Tobruk crippled the South African war effort, and accusations of blame for the surrender would be traded by British and South African veterans for the next 50 years. First Division returned to South Africa at the end of the year, to be disbanded. A new 6th Armoured Division, with its troops having sworn new oaths allowing service outside Africa, would be formed in 1943. But that’s a different story and a different game. Third Division never reached operational status because of shortages of white volunteers willing to serve outside the Union, instead becoming a training establishment. Its 7th Brigade was the most complete of its units and while the rest of the South African Army fought in the desert of eastern Libya it too was in action, fighting the Vichy French garrison of Madagascar. Officially a motorized brigade intended for the eventual formation of 1st South African Armoured Division, the brigade left its trucks at home when it went to Madagascar for six months. Some in the British high command wanted the 7th sent to Egypt to replace the lost 5th Brigade, but the South African Army preferred to keep the unit at home and speed formation of its armoured division. The South African Army appears in Panzer Grenadier: Africa Orientale Italiana, a game based on battles of the Allied campaign in Italian East Africa in 1940 and 1941. There are 88 die-cut-and-mounted South African pieces, which see action in nine of the game’s 45 scenarios. 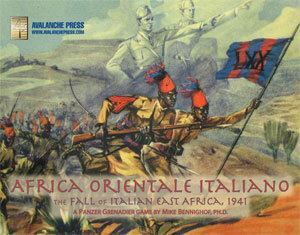 Don’t wait to put Africa Orientale Italiana on your game table! Join the Gold Club and find out how to get it before anyone else!